White spots, brown spots, and decay can all result from a lack of proper hygiene during orthodontic treatment. Many cases need to be fixed with dental bonding. This young woman from Orange did not take care of her teeth when her braces were on. We fixed it with bonding. Note the orange tongue ring – which we told her not to wear. Photos and dentistry Dr. Nicholas Calcaterra. In the above photo, you can see both banded white spots as well as brown spots. All are characteristic of poor hygiene during orthodontic treatment. Her case was so severe that correction with MI Paste was not an option. This was completed over two visits with dental bonding and she was ecstatic! Note the orange tongue ring… which we told her not to wear. Oh well… we can’t win every battle! His teeth were perfectly white before the braces went on. We counseled him and his parents immediately. His orthodontist was aware of this. 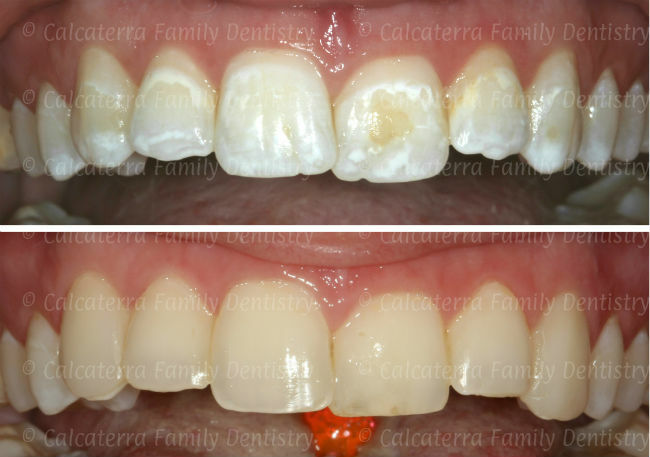 Notice the white spots, the brown areas, the inflamed gums, and the actual cavity forming? With a lot of hard work, we were able to turn the ship around. But his teeth were perfect before the braces went on. We’d Love to do Bonding… Not! 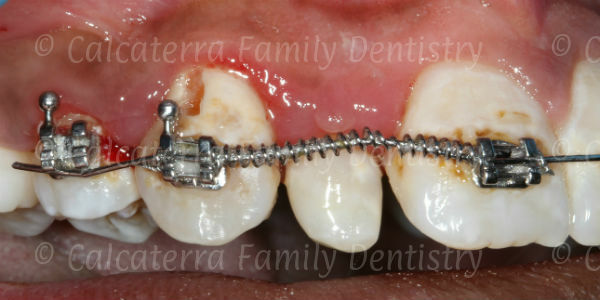 We are always up for the challenge of fixing a patient’s smile after braces. We have dozens of before and after photos we could post. But what we love even more is watching the braces come off and not having to do a darn thing! So, let’s avoid the need for bonding, correction with MI Paste, and veneers… just take care of your teeth when the braces are on and you’ll be all set!